Hey everyone! I was able to get some crafty time in yesterday (wahoo!). I had so much fun making this card. 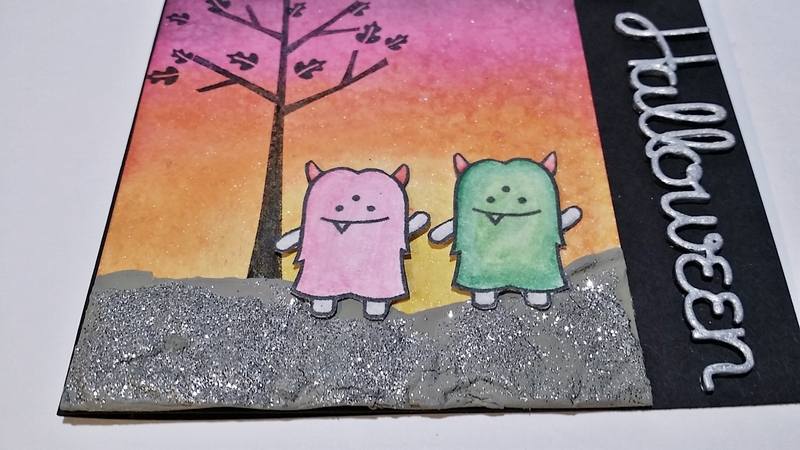 I started off the background using only inks from the Tim Holtz Distress Mini Distress ink kits #1 and #2. < Click there to purchase for the super low price of $5.59! I blended them using foam. I started off with Mustard Seed, then Spiced Marmalade, Picked Raspberry, Seedless Preserves, and lastly Salty Ocean. When the blending was done, I gave the background 2 spritzes of Hawaiian Shores Luster Mica Spray Mist. Then I stamped the tree and leaves from Lawn Fawn’s Sweater Weather Stamp Set. I used a silver metallic gel stick from Faber-Castell mixed with a little bit of water to stamp the stars at the top. The ground is a mixture of spackling and slate grey acrylic paint that was applied with a palette knife. I dried one layer a little with my heat tool (it will bubble if you heat it too much) and then applied a second layer which was then sprinkled with Martha Stewart glitter. 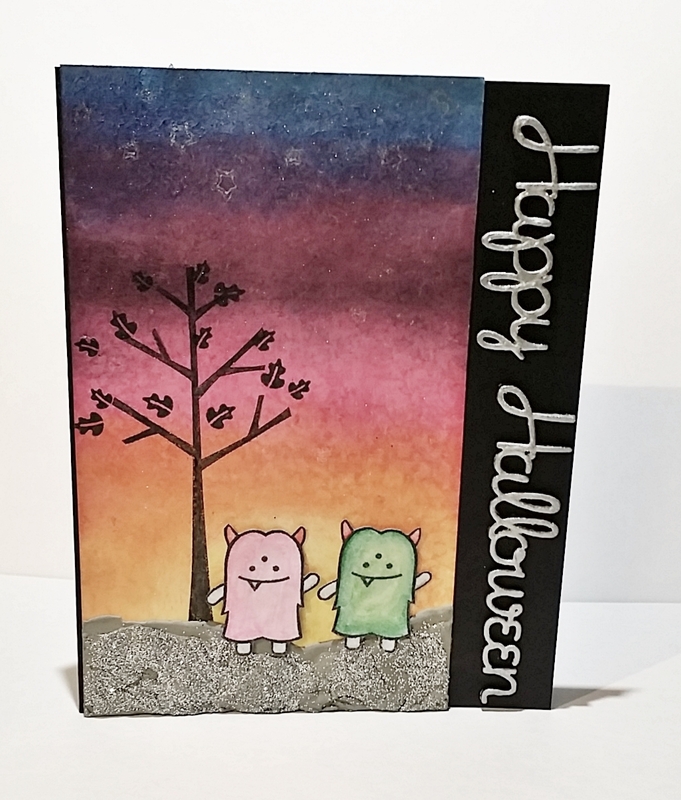 The cute little monsters are from Lawn Fawn’s Spooktacular Stamp Set. I colored them with watercolor pencils ( a technique I am trying to get better at!) and fussy cut them. They were applied with homemade glue dots. 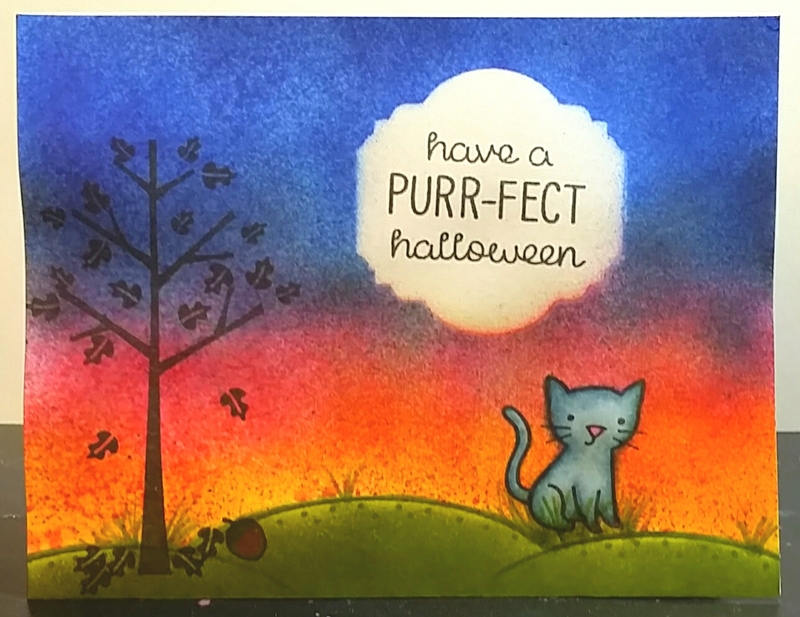 The beautiful sentiment on the side of the card is a chipboard laser cut by Intoxicating Arts. These are $1.69 and come in a 2 pack with one Card Maker size and one Scrapbooking Size. 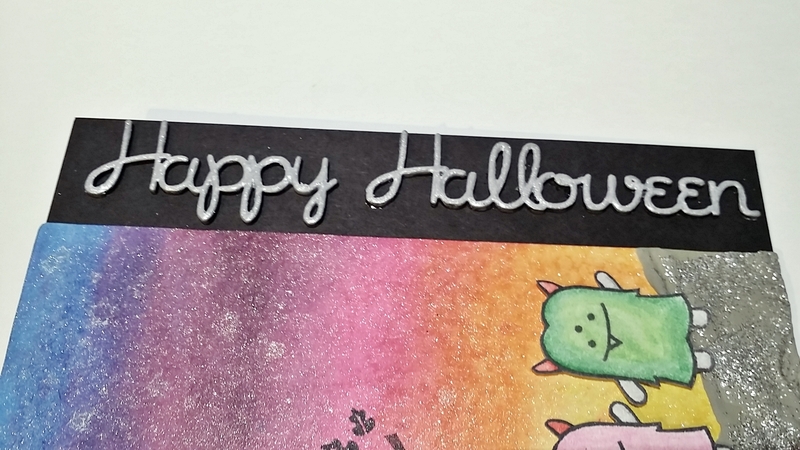 The chipboard was colored using the same silver metallic Faber-Castell Gel Stick, but this time it was mixed with Claudine Hellmuth Studio Gloss Medium. I also used the gloss medium to adhere it to the card stock. I hope you enjoyed this card and if you have any questions, please let me know! 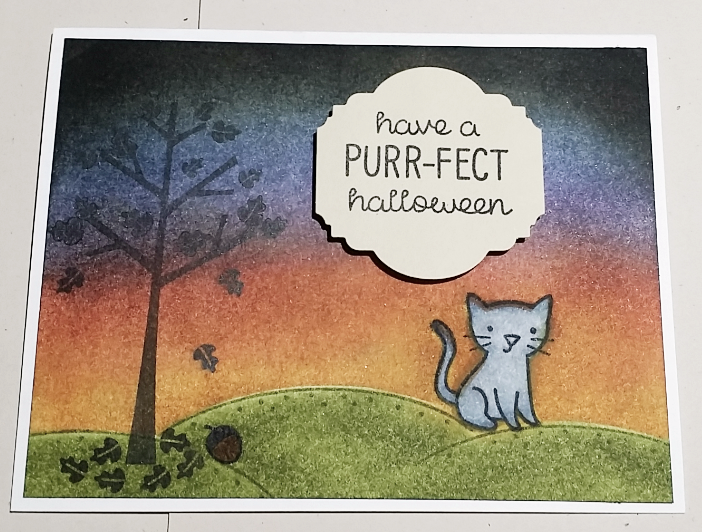 I had some fun last weekend making some Halloween cards using some NEW Lawn Fawn Stamps. I really enjoy making scene cards. I made almost the same scene on all of these cards, but I used different techniques each time. I used alcohol markers with the distress spritzer, water color, distress ink blending, masking , etc. I plan on making more of these scene cards and trying out different techniques to see how many cool looking sunsets I can get! 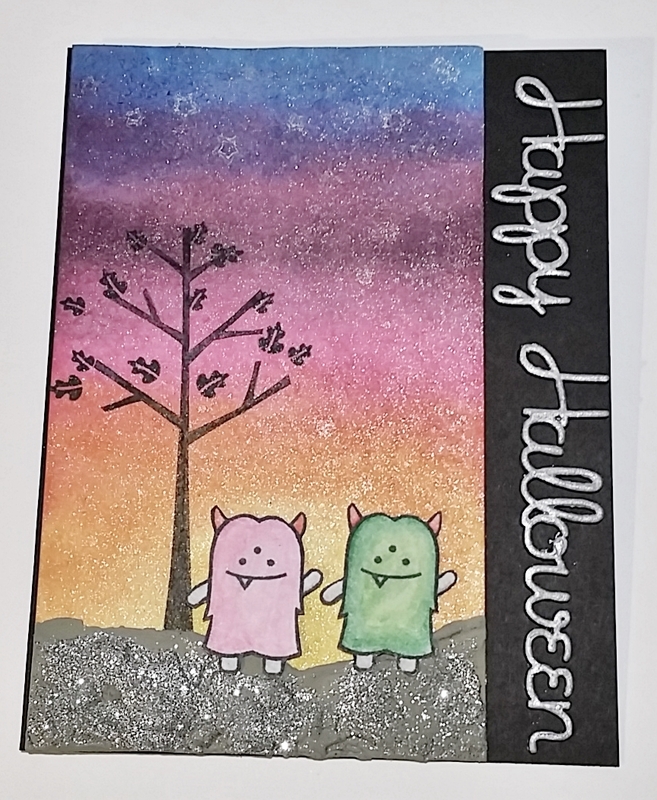 I used the little hill from Lawn Fawn’s “Life is Good” stamp set. 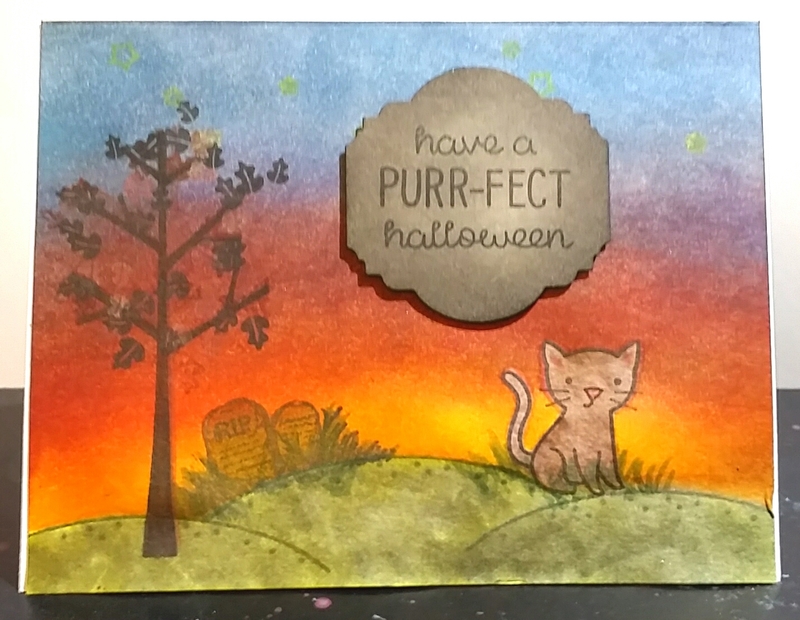 The cat and sentiment are from Lawn Fawn’s “Spooktacular” and the tree and leaves are from Lawn Fawn’s “Sweater Weather” . Both of the sets are available in our store by clicking the link. They are only $14.49 and you get FREE shipping if you spend over $40.00. That’s pretty easy to do considering we currently have 25 different items from Lawn Fawn available!